“Gracious Leadership is more than a book, it is a case study of one individual—the author, who describes her experiences from childhood and family values to the impact family values had on a career in both the financial and health care industries. A successful and remarkable CEO, the author emphasizes, that the basic principles of Gracious Leadership are transferrable regardless of corporate, organizational or even government focus. Perhaps, and most importantly, the author provides insights as to why some leaders miss the mark. Janet Meeks has blessed us with a documentary, a guideline, a new label and introduction of a completely new description of the attributes of Gracious Leadership. Regardless of position, title or responsibility, or even type of organization, I find this work to be more than insightful. Early in my reading, I knew I had to complete this work when I noted the following words from the author: ‘I believe teams of all types within all industries and organizations can reap great rewards from displaying gracious and respectful behaviors as they seek to optimize their collective performance. This holds true at home, on the basketball court, in the C-Suite, or in the Boardroom.’ The preceding words clearly established that Gracious Leadership is about a focus on people, the people within the organization who ultimately make the organization what it is or becomes. John Fleming, Author, Consultant and Speaker; former Publisher/Editor-In-Chief of Direct Selling News; former senior executive of Avon Products, Inc.
“Gracious Leadership: Lead Like You’ve Never Led Before provides invaluable insights into leadership—real and true leadership. The Key Ingredients shared by Janet are precisely those required for GREAT leadership. Whether you are just beginning your journey to become a world class leader or you have many years in your role as a leader, Janet’s insights are inspiring and remind us all what is important in developing ourselves to our fullest potential. “Readers may be easily overwhelmed by the hundreds of leadership books with catchy titles lining the shelves of bookstores these days. 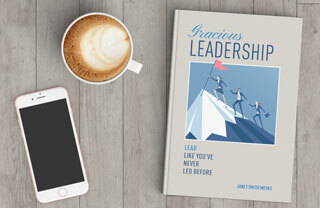 With the publication of Gracious Leadership: Lead Like You’ve Never Led Before, Janet Meeks has made a unique contribution to the collection. Her description of the key ingredients of Gracious Leadership draws not only from the research literature but from the personal stories (hers and others) of successful leaders. Her treatment is ‘elegant in its simplicity.’ Although it may seem simplistic to say that effective leaders demonstrate both ‘head and heart’ competencies, Janet provides the reader with true stories of how this dynamic duo looks in action!